DESIGN: AGS-8 series aerosol fire extinguishers generate dry aerosol cloud which extinguishes fire upon reaching necessary concentration in protected volume. AGS-8 series aerosol fire extinguishers are made in a shape of a metal cylinder with a nozzle cap at the top. AGS-8 series aerosol fire extinguishers featuring special labyrinth cooling design which significantly reduces the outgoing aerosol stream temperature. AGS-8 series aerosol fire extinguishers are manufactured in two different sizes - AGS-8/1 and AGS-8/2, with protected volumes of 60 m3 and 125 m3 correspondingly. Modifications also differ by dimensions and weight. Please see tech specs for details. 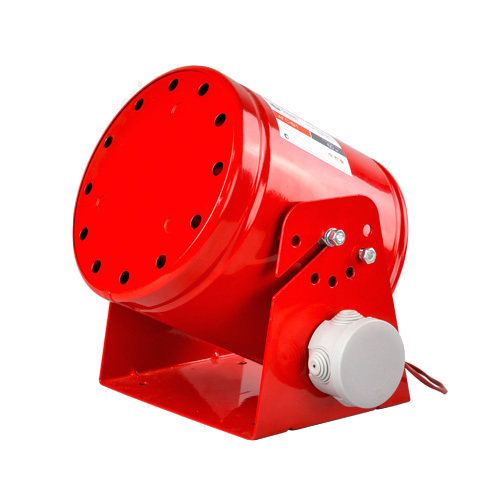 APPLICATION: AGS-8 series aerosol fire extinguishers are recommended for use in wide range of applications as executive modules of automatic fire extinguishing systems for protection of the premises of medium and large volumes. Due to low temperature outgoing aerosol stream AGS-8 series aerosol fire extinguishers may be used in the temperature-sensitive applications such as aviation hangars, car garages, storages, server rooms, data centers, computer classes, libraries, museums, archives, etc.